Divya Bharti and I had always shared a good rapport, which even her parents will vouch for. So, as I walked into the compound of their building, a chill ran down my spine, as memories of the funeral procession flashed through my mind. I was numb with shock, seeing her lying motionless on the stretcher. She was dressed up in the bridal finery, but instead of her husband house, she was taken to the crematorium. Visions of the tragedy still haunt me, even as I write about my meeting with sorrowing parents. The sitting room has several life-size portraits of Divya. A large one over the dining table has a beautiful garland and lighted agarbattis. Both Meeta and Om Prakash Bharti were happy that I had remembered their daughter’s birthday. As usual, Divya’s mother was the first to inform me. Till today, people remember Divya’s birthday. Her fans send us letters, birthday cards letters and see this fan has even written her name in blood.” His eyes filled with tears as he showed every card and letter. Several were from England and America. Since Divya’s father wanted to continue, we let him speak first. April 5 is Divya’s second death anniversary. Today, Rajiv Rai’s assistant Shabbir called me. ‘Uncle I’m making a movie on Divya Which will be shown on Doordarshan. I need your permission to use the unused footage from her films nd the films she could not complete, like Mohra, Ladla, Karthvya. “My daughter was a popular. Where ever I go people say, ‘That’s Divya’s father’. Once they know I am Divya’s father their attitude changes. Even the industry people still remember us. Raju Mawani invited us in the premier of Surakshya. Pehlaj Nihalani still comes over. Sunil Shetty is like a family member. But on our own, we never attend any film functions, so that we don’t feel hurt. Although it is now two years since Divya passed away. It is still difficult adjusting to not having our precious daughter with us. I don’t know why God had to play such a cruel trick. She would have been 21 today. 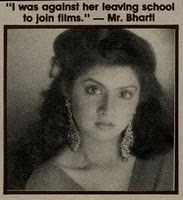 About Divya joining films Om Prakash says, “I was against her leaving school to join films. I wanted Divya to study and make a name of her-self. In spite of not doing the studies, she still made her name. it was fate that made her star and it was her fate that she died so young. People say that she would have become the number one star. “I remember she had first wanted to become an airhostess. Then she got attracted to films. Sometimes she would ask ‘Daddy, don’t I look like Sridevi’? and she would mimic Sridevi. But when she was in ninth standard people began approaching her to do films. I could do nothing to stop her from joining films. When her first film Vishwatma was released, nobody could say she was a raw actress. Till today people remember her in ‘Saat samundar…’. People from Canada, England write to me to put a flower in her memory on her photograph . Kadar Khan once told me, ‘Why did God take her away? God should take me’. There’s not a single actress who does not mourn Divya’s death. “Regarding the mystery of Divya’s sudden demise… “ there’s nothing new to the investigation. The police say that it was an accidental death. So, we also tell people that it was an accidental death. Probing into the nature of the death won’t bring our daughter back. There’s no need to know. 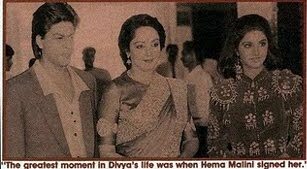 All I know is that Divya is gone forever why he took Divya away at such a young age. If he were to take her so soon, then why did he give her to us? Her room is still kept in the same way. It still has her photographs. Sajid’s office desk still has one drawer that is kept locked till today as it contains all Divya’s things. Sajid’s bedroom is filled with her pictures. Now Divya’s mother, Meeta Bharti, takes over, “ I was really surprised that you remembered my Divya’s birthday. You know I am still surprised that I get eight to ten letters every day for Divya. I thought it would stop. This is the second year after Divya’s death, at least it will be on April 5 and they’re still pouring in." “Divya was always soft-hearted, she would never insist on getting her payments immediately. Sometimes, even after the film was released she was still to get her money from the producer. Oneday I told Divya that in a couple of years she would be working for free for every producer as everyone would be like her brother. She was not money minded at all”. “After seeing the success of Mohra, Laadla and Vijaypath, I can’t help but feel sad. Had she been alive, Divya have got the credit. She would have been a big star today. Had Divya still been around, she would have given Juhi Chawla stiff competition. Because of her death so many people have stood to gain: Raveena tendon got Mohra, and her career began to rise. Tabu got noticed of Vijaypath. Even sridevi’s career got a boost with Laadla. Puja Bhatta bagged Angrakshak with Sunny. Now it has shaped up so well. Mamta got Andolan because of Divya’s death. People do things for others when they’re alive. But Divya had helped people even in death. I also feel I shouldn’t say that they were successful because of my daughter. “Many people still think that Divya lost Darr because she had a problem with Yash Chopra. That wan’t the case. 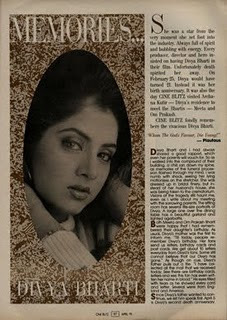 When Sunny was signed, he wanted Divya opposite him. But Aamir wanted Juhi Chawla. Unfortunately, at that time, we were in America for some shows. Before we left they announced Darr with Sunny, Divya and Aamir. When we returned it was Sunny, Juhi and Aamir. It seemed that Aamir who was also working with Yash Chopra in Parampara, managed to push Juhi and had Divya dropped. After he got Juhi into Darr, he was dropped and Shah Rukh was taken. “That very day Boney Kapoor signed her for Prem opposite Sanjay Kapoor. Eight days later, Tabu was signed and Divya was dropped. Subash Ghai met her at the HMV party for Prakash Mehra’s Jaadugar. Next day he called Divya to do a screen test. Twenty days later, he phoned to say that Divya was too young to act with Dilip Kumar and Raj Kumar. That’s how she lost many films. As a result she began to lose interest. 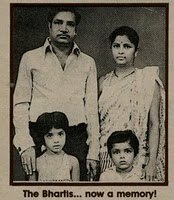 Fortunately producer D. Rama Naidu signed for a Tamil film and Rajiv Rai signed her for Vishwatma. When released both became super hits." “Among today’s girls, I don’t like Juhi and I don’t like Karishma at all. Raveena may be a star today but she’s not very expressive. She has quite a manly face. When I saw Aamir Khan’s dance sequence in Baazi, where he was dressed like a girl, I thought it was Raveena. The most promising girl I feel is Kajol. She has talent. She’s spontaneous like Divya. Kajol likes to laugh and joke, and the next minute she can do a very serious scene. Divya was like that. Once David Dhawan pulled Divya up, Don’t fool be serious. It’s a serious scene’. She replied, ‘David if it’s a death scene, should I die for it’? Divya was natural. After seeing Bekhudi, Baazigar, Yeh Dillagi and Udhar Ki Zindagi, I felt Kajol was a good actress. I did not like her in Karan Arjun. I see all Kajol’s films. Though I have never meet her, I feel she is a very talented person – very natural. Whoever can perform comedy, can do any role. Nobody but Kajol can do that. Pooja Bhatt is also quite good. But nobody can be compared to our Divya. We still miss her”. So do we at Cineblitz. 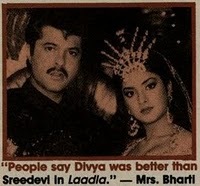 Divya was one helluva girl!